Today you are 8 months old. 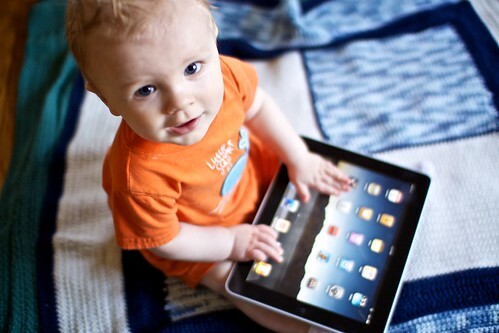 You are growing up so fast! You have changed a lot during this past month. You started sitting up on your own just after you turned 7 months old. You were sitting up before then, we just always supported you. Then one day your dad sat you up and let go, and you stayed sitting and grinned. You are getting better and better at sitting up on your own. You like to sit and play with your toys. We do have to keep an eye on you though, because every once and a while without warning, you get tired and fall on over. You were sleeping terribly at the beginning of the month, but in the last couple of weeks you've been sleeping 11 or 12 hours straight through! Unfortunately I've been having insomnia, so I haven't been able to enjoy the benefits of your improved sleeping. Just as well I suppose. For the last 2 nights you were up in the night again, so I'm afraid your streak of good sleeping might be over! We'll see. Even though things were going well at nighttime, it was pretty tough during the day. You completely stopped napping, but it wasn't because you weren't tired. I don't know why. It was always difficult, but I used to be able to get you to nap through an extended routine of rocking, swaying, and patting your back. I always wondered what would happen if that system fell apart. This month I found out: there was a lot of crying (from both of us). You fall asleep just fine, but the instant I try to lay you down in bed your eyes pop open and you begin to holler. The only way you can get some rest is if I just sit there and hold you until you wake up refreshed. Or if I take you out in the stroller. If I do that though, I've got to drape a blanket over the front of it so you can't see out too well. Then you're out like a light. If I don't do that, you are too busy looking around to fall asleep. 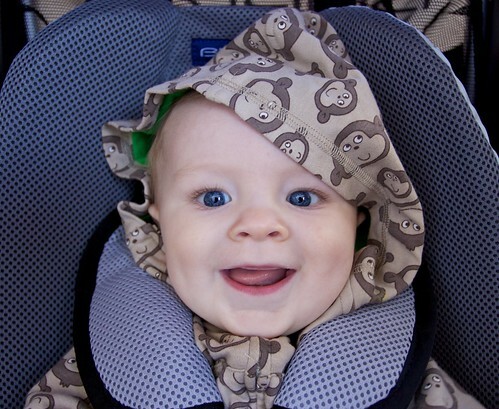 Speaking of going out and about in the stroller-- thank goodness for spring. If only we lived in a place where it was spring all year round. Spring has saved us all. Just about every day (unless it is raining) we go out for walks. More and more I've been taking you running with me too (courtesy of Aimee and Brett's jogging stroller!). It's been great. It makes me wonder how we ever got through the long winter, being all cooped up inside. 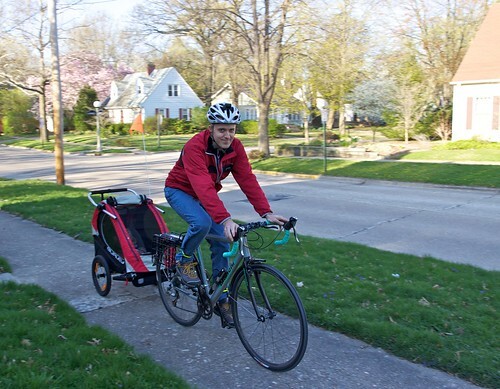 Your dad also got a bike trailer for you and took you on a bike ride. I was a little scared about that, but you had a good time! With the warmer weather, we've finally stopped swaddling you. I'd been kind of worried about how that would go, since sleeping has always been a bit of a challenge. I'd kept thinking that you needed to be swaddled in order to sleep, because whenever I'd tried to lay you down unswaddled, you'd wake right up again. Well on one of these first warm nights, you woke up crying around 11pm, and when I went in to see you, you were hot and sweating. I unswaddled you and held you for a minute, and you went back to sleep. I lay you down in your bed and you stayed sleeping. You woke up just once more that night, which wasn't too bad all things considered. Since then, I haven't swaddled you again, and it's been working pretty well! Now that you're unswaddled and more free to move around, you've taken to sleeping on your left side. The other morning when you woke, you were at a 180 degree angle to the position I'd lain you down in. I still don't know how you managed that. The other big thing is that you are getting teeth! On April 8th, your bottom gums looked bumpy, and on April 9th, I could see the tiniest bit of two bottom teeth just starting to poke through. When you grabbed my finger to chew on it, they felt sharp! You have also tested them out by biting my chin and shoulder. So far they haven't grown up anymore over the gumline. It is ironic that your teeth came through just as you were on the best behavior of your life. Ever since you were born, you've behaved liked you were teething, but when your teeth actually came through, you were fine. I don't know how this teething thing works, though; maybe the worst is yet to come. Mama got her hair cut this month too! You've been doing really well with eating solid foods. It's hard to believe 2 months ago I could barely get you to eat a pea sized amount of anything once a day. Now I feed you a variety of foods at breakfast, lunch and dinner. Usually you have homemade rice cereal with fruit (banana or pear) for breakfast, carrot and zucchini for lunch, and avocado with another fruit for dinner. So far in the past 2 months you've eaten: avocado, bananas, rice cereal (store bought and homemade), sweet potato, pears, squash, millet, sweet peas (store bought), carrot, zucchini, plums, and apple. I think next we'll do green beans. Other things you are doing include removing your own clothes (don't you hate pants?). You grab your feet and pull off your socks so that you can stick your toes in your mouth. You remove your diaper cover. You've also reached the stage wherein you cry if I don't let you have something you want. You try to grab the mail out of my hands and cry when I hold it out of your reach. You grab your spoon and chew on it when I'm trying to feed you. When I wrestle the spoon away from you to load it up with whatever you're eating, you throw your head back and cry. William, I've written this letter typing one-handed while you were sleeping in the crook of my arm. Because you won't sleep in your bed, but you were very tired. I know that someday you will be 13 and aloof, and I won't get to hold you anymore, so I'm just holding you close to me now, while I can. William, I love you more and more each day.